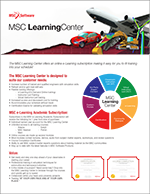 The MSC Learning Center is a comprehensive learning platform that centralizes time-intensive training of industry-standard CAE simulation software to educate engineers at all levels, across a range of simulation software tools and applications. Join the MSC Learning Center University community to build valuable skills and learn the numerous ways modern technology is applied while visualizing and testing your knowledge of theoretical concepts. Connect with subject matter experts and the engineering community at top manufacturing companies through fully integrated discussion forums attached to each course. Start Learning University Subscriptions to the MSC Learning Center are available to students and educators for a low academic annual rate of . Follow the steps below to purchase your subscription. Students, Follow the steps below to purchase your subscription. Educators, Researchers, Click HERE to get started. Register to download the MSC Student Edition. Skip and go to 2. Purchase your MSC Academic Learning Center Subscription. You must create an account to log in and purchase your subscription in the MSC Learning Center. Create an MSC Learning Center Account now. Once your MSC Academic Learning account has been created, log in to purchase your academic subscription. Login to Purchase Now.